It’s New Year’s Day and that end of the long break/going back to work cloud descends on me as it always does. I love the Christmas break, possibly even more than the summer break and when it comes to an end it does bother me even though I love what I do – those days of doing nothing, hanging around the house and relaxing are so enjoyable but at some point you have to get back to reality. When I started to think more about the first day back I started to look forward to seeing our crew again. While the break was great it would be good to see them all again and catch up. During the course of a year we spend a lot of time together and it’s natural that you get to know everyone quite well and you do form special relationships, even if it is predominantly in a work context. The more I thought about seeing the crew again I thought about greeting them after not having seen them for the best part of two weeks. For me the natural greeting for each of them would be a hug – a genuine warm hug, which reflects how I feel about all of them. I would hate to be heading back to work and to be meeting anyone in our team who I didn’t like, who I didn’t feel any connection with, who I preferred not to spend time with. That would be awful and in the course of my career I have been in that place more than once. My cloud cleared and I was now actually looking forward to getting back to work. 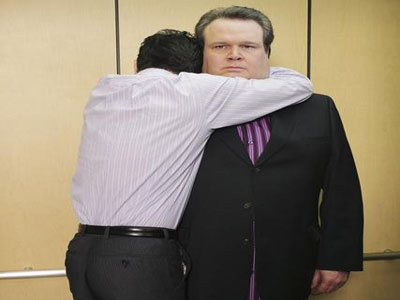 Will your first day back at work pass the Hug test? This entry was posted on January 5, 2014 at 4:54 pm and is filed under Christmas, Holidays, Motivation, Teamwork. You can follow any responses to this entry through the RSS 2.0 feed. You can leave a response, or trackback from your own site.